Travelling from the UK to the continent? 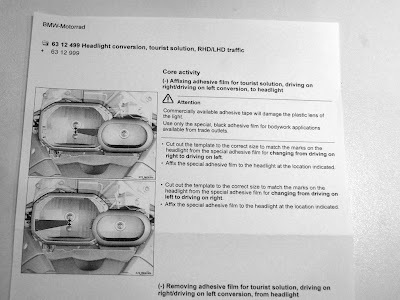 This is the ‘official’ BMW document supplied to dealerships for masking out the area on the headlamp when driving in countries on the opposite side of the road. One problem—BMW don’t supply the adhesive film for doing so and the AA ones aren't designed for motorcycles. After some digging on a few forums, and thanks to several responses, I believe the best choice for this is the type of vinyl used for colour-change wraps for cars as this should take the heat of the headlamp without damaging the plastic lens cover. Here are a few simple steps for making one yourself—one that looks professional, won't ruin the lexan headlight and will come off easily once back in the UK (or other RHD country!). Find a car wrapping company and ask them for some scraps of (preferably matte) black vinyl designed for covering cars (this will take the heat of the headlight and come off cleanly later. I had good luck at Cover Wrapping on Wilcox Road, London SW8 who kindly gave me a generous measure of scrap vinyl at no charge. Download and print out the linked PDF—ensure that the print settings are set to print at 100% (not ‘fit to printable area’). Cut out the template and rough-cut a scrap of vinyl approximately the same size. Place the template black-side-up on the front of the vinyl and cut around it—repeat as necessary to have a few extras. When on the train/ferry to the continent, put your time to good use affixing the vinyl to your (clean and dry) headlight within the areas etched into the headlight itself (see the lower diagram in the BMW document to the left). Your’re finished! Now you can drive in the continent without risking a fine for glaring other motorists. To remove, the vinyl should peel off easily (use some sticky tape to pull up on the vinyl if necessary).